Steamed Cheeseburgers are the easiest cheeseburgers you can make! They’re ready in about 15 minutes and there’s no messy pan or splattered grease to clean! I love cheeseburgers. I hate to cook them. To grill them takes ages. To cook them on the stovetop means dealing with grease splattering all over the place, plus cleaning a messy pan. Steamed Cheeseburgers are the easiest cheeseburgers you can make! They’re moist, tender and tasty. They’re ready in about 15 minutes and there’s no messy pan or splattered oil to clean. 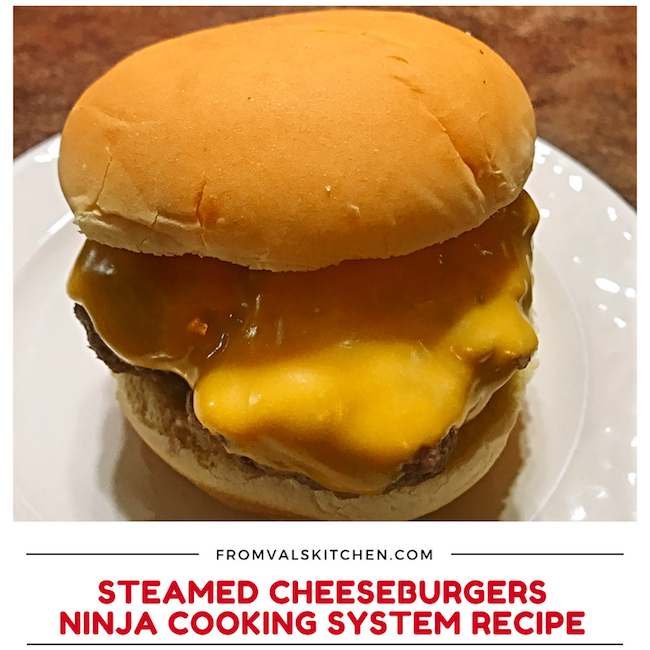 Cooking steamed cheeseburgers in the Ninja Cooking System means easy clean up and you’re not heating up the kitchen. Here’s how I make them. Place the Ninja’s metal rack into the bottom of the pot. Turn the Ninja on and select stovetop high. Place the ground beef into a mixing bowl. Add the seasonings and combine thoroughly. Divide the meat mixture into three equal parts. Shape the three portions into burgers. Place the burgers onto the rack and place the cover onto the pot. Steam for about 9 minutes. Remove the lid and place the cheese onto the burgers. Put the lid back on and let the cheese melt, which takes 1-2 minutes depending on how melty you like your cheese to be. While the cheese is melting prepare the buns. Serve immediately with your favorite burger toppings. Add 2 cups of water to the pot. Place the Ninja's metal rack into the bottom of the pot. Turn the Ninja on and select stovetop high. Place the ground beef into a mixing bowl. Add the seasonings and combine thoroughly. Divide the meat mixture into three equal parts. Shape the three portions into burgers. Place the burgers onto the rack and place the cover onto the pot. Steam for about 9 minutes. Turn the Ninja off. Remove the lid and place the cheese onto the burgers. Put the lid back on and let the cheese melt, which takes 1-2 minutes depending on how melty you like your cheese to be. While the cheese is melting prepare the buns. Serve immediately with your favorite burger toppings. Enjoy! You are a genius. 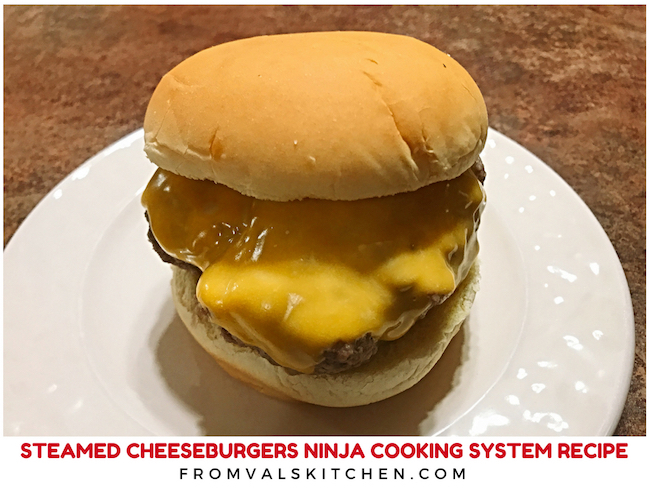 I never would have thought to make burgers in my Ninja. I totally need to try this. I don’t have a Ninja and never knew you could do a hamburger in a Ninja. Good information to know and I bet that burger was yummy. I don’t have a ninja but these burgers look great! Maybe I need to get one. I need to get a Ninja! When I make burgers on the stove top, they don’t always turn out. I’m sure they’d come out so much better with this. A restaurant in my state is famous for making steam cheeseburgers. I would have never thought about making them at home. This recipe looks delicious. I don’t have a Ninja Cooking System yet but it’s high on my list of next kitchen must haves. Steamed burgers have a unique flavor in my opinion and it’s a perfect cooking method for sliders. I’ve never had a regular sized steamed burger so I may have to try this recipe. I don’t have the Ninja system so I need to make burgers the old fashioned way on the outdoor grill. I am sure beef lovers would really like this system. I haven’t heard of the ninja cooking system before, but it looks like an excellent kitchen tool if you’re short on time for dinner! The burger looks delicious! Whoa, this looks SO good! I really need one of these Ninja cooking systems, I bet you can make some awesome recipes with it! I’ve been hearing so much about this Ninja cooking system and it’s about time I look into getting one. I think this burger would be really fun to make for my fam! Oh man this cheeseburger looks amazing! I need to make this for myself!! 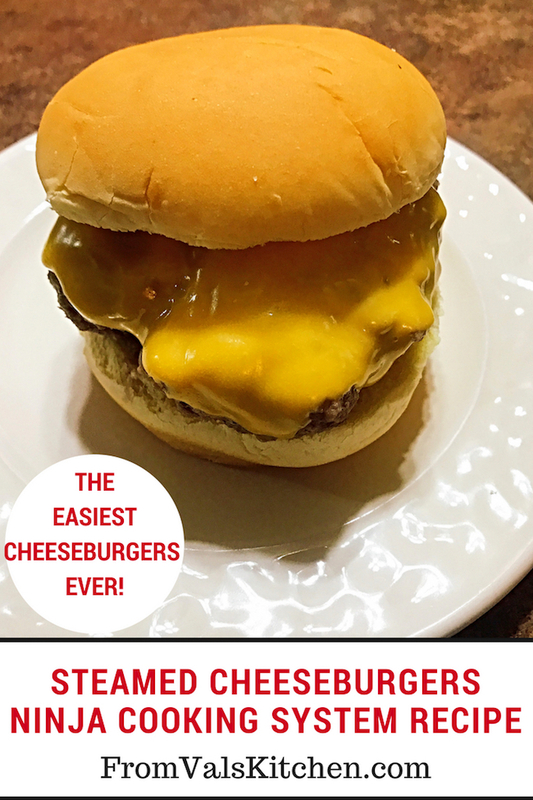 Cheeseburgers are easy to make and we cook them a lot of times since it’s my husband’s favorite. Having a cooking system like this will definitely make the cooking process easier. My husband loves any kind of burger. This looks so good even I who isn’t really fond of burger would love one. This Ninja system sounds awesome. I totally want to get one because I think it would make food prep so much easier. These burgers look great! Sounds like a good appliance to take on travels. With the summer hitting off, hamburgers and hotdogs are definitely back in top choices of food this season. I think it’s really awesome to try this steamed cheeseburger recipe. I like the idea of the meat being steamed! My family loves cheeseburgers and this would be a great meal for them. Those burgers look juicy! We love cheeseburgers here at grandma’s kitchen. I’ve never tried them this way but now I must. I hate being splattered with hot grease while cooking them.